Starting tonight, Disney Channel stars Phineas and Ferb kick off a rockin’ summer celebration that visits the beach, the jungle and under the sea with favorite Disney characters and cherished Disney music – and it all plays out on Cinderella Castle, famed icon of Walt Disney World Resort. It’s the newest performance of the award-winning “The Magic, The Memories, and You!” Castle projection show that has amazed Magic Kingdom guests since debuting 15 months ago. As part of Disney’s “Let the Memories Begin,” the ten-minute, nighttime spectacle features photos of guests captured in the park that very day making memories — projected larger than life among the spires, towers and turrets of Cinderella Castle. 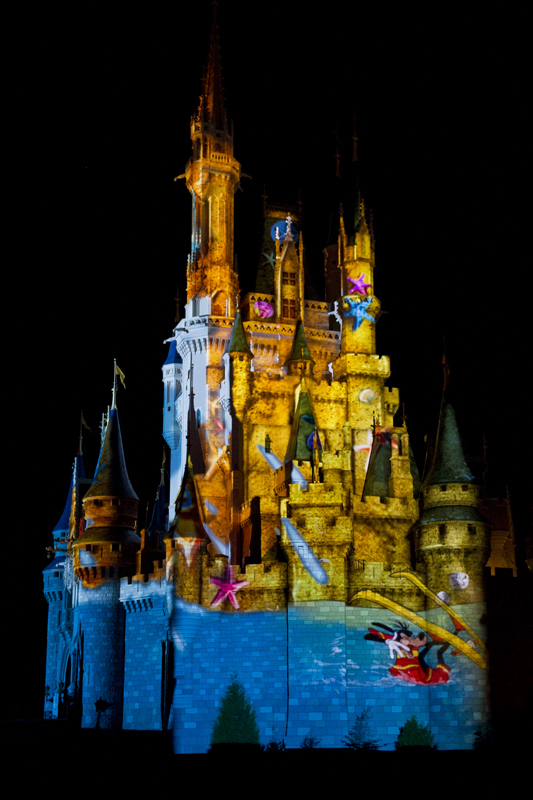 In similar fashion, guest images are projected onto “it’s a small world” at Disneyland Park in California. The popular Fantasyland attraction in Anaheim, Calif. also will feature the new summer show tonight. And what a show awaits guests on both coasts! Hang ten with surfin’ Goofy, join Timon and Pumbaa in singing Hakuna Matata, and rock out with Ariel, Sebastian and the hot crustacean band at the bottom of the ocean. Along the way at Disney World, the Castle goes through some dramatic, eye-filling transformations, from sand castle to ancient vine-covered ruin to colorful finger-painting to tropical aquarium. With a fast-paced musical score and plenty of visual surprises, this will be the latest must-see magic that has brought Cinderella Castle / “it’s a small world” to life for the past 15 months – while retaining some of the most popular scenes that made it a hit with guests when the show bowed in 2011. As always, the dazzling show will feature more than 500 photographs taken in each park daily, producers estimate, as guests make memories to last a lifetime. Producers storyboarded the show as if it were a short animated film, explained Alan Bruun, creative director, Disneyland Resort. They weaved music, story, photography, video and animation into a new kind of nighttime entertainment. Show times vary depending on park hours. “The Magic, The Memories, and You!” is included in theme park admission.